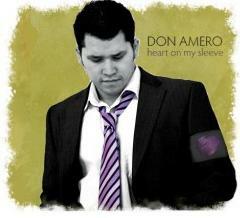 Winnipeg-based indie musician Don Amero (called a “John-Mayer meets-Keith-Urban” singer-songwriter) is donating a portion of the proceeds of his fall tour and recently-released fourth CD, Heart On My Sleeve, to Canadian Feed The Children. Having grown up on a reserve, Don has a special passion for First Nations’ children and does quite a lot of public and motivational speaking to First Nations’ communities. Don wrapped up a Canada-wide tour on October 24 in a live-streamed, 90-minute “intimate and interactive” concert webcast by APTN. He was joined by special guests to perform material from his new album and previous fan favourites, and launch the world premiere of the music video for Turn These Grey Skies Blue. A couple of weeks later, the independent musician with a growing following of fans was nominated for three awards and walked away with the coveted “male entertainer of the year” at the 7th annual Aboriginal Peoples Choice Music Awards held in Winnipeg. Don’s CD would make a great stocking stuffer for the music-lover in your family – and you’ll know you’re also supporting CFTC’s work, too! Visit DonAmero.com to order your copy – and a few for your friends – today!